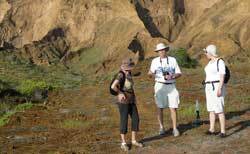 All Galapagos cruise itineraries include activities each day. There are normally at least a morning and an afternoon activity and sometimes a few more in between. The onboard naturalist guide always gives an in-depth briefing about what to expect; the type of landing; what you might expect to see; what clothes and footwear might be appropriate. And land based itineraries are also built around activities. The Galapagos is not a place to go just to sit on the beach or on a cruise boat, so the activities are an integral part of our holiday. There are lots of trails throughout the Galapagos Islands, but as you might expect you are not allowed to just walk wherever you want to. Once you are away from human habitation these islands are very carefully controlled as important conservation areas. There are a series of recognised official visitor sites and these landing sites are the only place you are allowed to land and access the trails. And you are not allowed onto the island landing sites without a qualified and certified naturalist guide. This is very well done and the park authorities make sure that all the yachts can’t turn up at the same place at the same time. There is a limit to the size of a group that can land too. With an absolute maximum of 16 plus the naturalist guide you never feel as though you are walking a trail with a crowd. Landing at one of these sites may be at a small dock or onto rocks where you get directly from the dinghy onto dry land, known as a dry landing; or it may be a matter of getting out of the dinghy in the shallow waters of a beach, known as a wet landing. Then you head off along the trail with your naturalist guide. The pace is always nice and slow as the whole point of being there is to stop and look at the flora and fauna and to have time to take photos. The guide talks you through all kinds of stuff; from the geology of the rocks and sand you are standing on to the life cycle and behaviour of the animals around you. You can expect to see different things on different trails and on different islands. 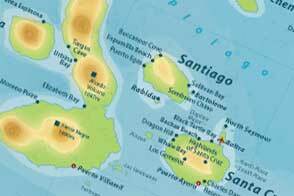 You’ll find detailed descriptions of the landing sites on our pages about the individual islands. But the experience of walking these trails and seeing wildlife that simply doesn’t move away from you is absolutely magical. A visit to the Galapagos highlands of Santa Cruz is frequently part of a cruise itinerary and also features on land based itineraries. There is quite a lot to see, including some impressive geological features like the sink holes – massive craters where the ground has collapsed downward, and lava tunnels, so big you can walk through them. Here you also find lush forests of Scalesia trees that are habitat to a different range of birds. The vermilion flycatcher is particularly brilliant and there’s a good chance of spotting one in amongst the epiphytic mosses, bromeliads and vines that hang on the branches of these misty forest trees. There is farmland up in the highlands too. 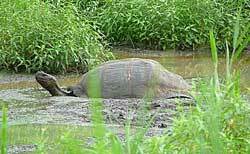 And the farms are the best place to see the giant Galapagos tortoise in the wild. They often provide a ideal protected environment for these massive reptiles which love to cool off by wallowing in the water holes. This is an absolute must! 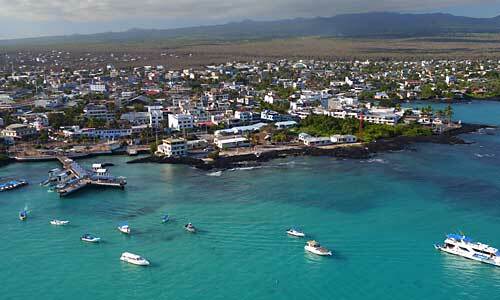 The Charles Darwin Research Station at Puerto Ayora on Santa Cruz is a research and interpretation centre. Here you can discover the history of conservation on the islands and the modern day challenges facing this unique archipelago. There are around 200 scientists and volunteers working here on a number of conservation issues. The most famous of these is the captive breeding program for the Giant Galapagos Tortoise. Some sub-species are close to extinction and here you can see the adult enclosures, incubators and young tortoises at various growth stages. It was here that the famous giant tortoise dubbed Lonesome George lived from 1972 until his death in June 2012. He was the last of the Isla Pinta subspecies and thought to be around a hundred years old. Sadly the attempts to get him to breed with similar subspecies were in vain. Another interpretation centre and is on San Cristobal Island, about a 20 minute walk from town. It focuses on documenting the history of the Galapagos, its ecosystem and flora and fauna from its volcanic origins to the present day. 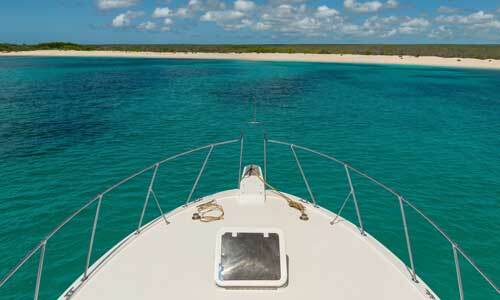 The waters around the Galapagos are rich with wildlife, and you don’t have to be a scuba diver to appreciate them. 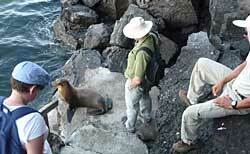 This is a regular activity offered on the cruise yachts and is a real feature of your Galapagos holiday. 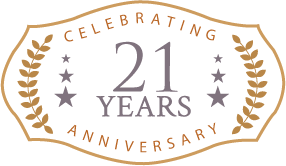 It’s available nearly every day on a cruise and is often done in the middle of the day between the morning and afternoon activities for those that want to; and it is also a regular feature of land based itineraries. Typically the yachts provide snorkelling equipment and towels free of charge although on some yachts there may be a small charge for the snorkelling gear. The water is generally pretty warm but if you’re in there for a long time you might want a wetsuit. These are available on the better yachts; usually for a small charge. Of course some people prefer to bring their own masks just to be sure they have a good fit. 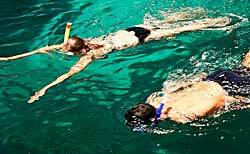 You can have a go at snorkelling even if you’ve never done it before and in some places even if you can’t swim. Where snorkelling is available from the beach the guide may well suggest you put on a life jacket and whilst still at a depth where you can stand he will help you use the mask and snorkel to look below the surface of the water. You’ll be amazed at what you see. For those more confident some of the snorkelling is done in deep water sites from a panga (dinghy). You may well find yourself swimming with sea lions playing around you or a penguin rushing past you like a torpedo – yes they’re fast under water. You can watch the marine iguanas grazing on seaweeds and algae on the rocks below the surface. And of course there are a million fish to keep you amused. It’s great fun. 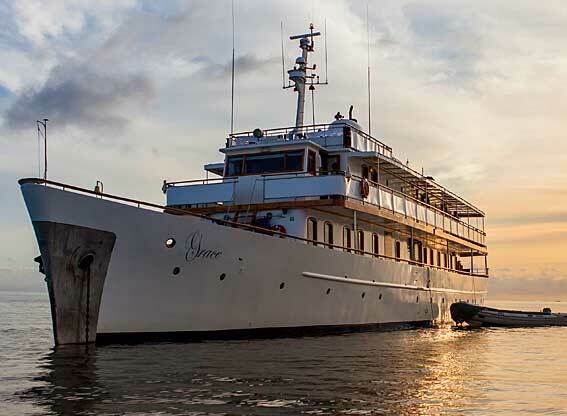 Several of the Galapagos cruise yachts have a kayak or two on board. It’s great fun to get these out and have a paddle about and the crew and guides will always let you know where this can be done. The park does have rules about where you can kayak but there are quite a few areas that are designated as recreational sites where this can be done. Often an itinerary on a cruise will include two or three suitable places during the course of a week such as Cerro Brujo at San Cristobal Island, Gardners Bay at Espanola Island, Darwin Bay at Genovesa, Tagus Cove at Isabela and the bay at Rabida Island. These activities will usually be offered as a choice, where you have to choose between snorkelling, a panga (dinghy) ride or kayaking. 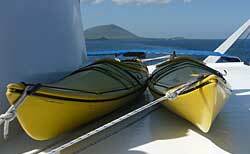 If you are doing a land based or island hopping itinerary then there may be more opportunity for sea kayaking. There are multi sport itineraries that include kayaking such as those which take in Isabela where you can paddle out from Villamil dock to Island Bay. Typically you might have sea lions swimming alongside you and you’ll have a good chance of seeing turtles and rays, penguins and blue-footed boobies. There are some decent hikes on some of the islands which are rather more energetic than just walking the trails at the landing sites. 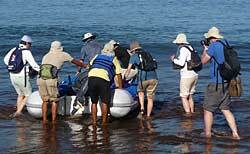 These tend not to be part of the cruise itineraries and are more suited to people doing a land based or island hopping itinerary on the Galapagos Islands. One of the best known hikes is on Isabela where you can spend a whole day exploring the highlands with a hike up to the crater of the Sierra Negra volcano. From here you can continue to the rim of the Volcan Chico, making pretty much a full day’s hike of it and covering about 16 kilometres through the day. It gives you a really good understanding of the geology of the islands as you explore one of the youngest and most active islands in the Galapagos archipelago. The paths can be a bit muddy if there’s been rain and it’s not uncommon for there to be a morning mist or light rain around the volcano. But when you get to the top the crater is huge, second only to Ngorongoro in Tanzania. You then continue to Volcan Chico walking across an unfamiliar landscape that’s fairly barren but surprisingly supports some life like the lizards that scurry about between the rocks. 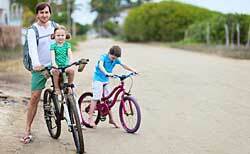 Mountain biking is an option if you are staying on one of the islands or doing an island hopping itinerary. There are some good wetland trails that can be biked on Isabela. Whilst on Santa Cruz you can do a long downhill ride from the highlands down to Garrapatero Beach. On the ride, you go past small farms and you get good views of the ocean and the distant islands. 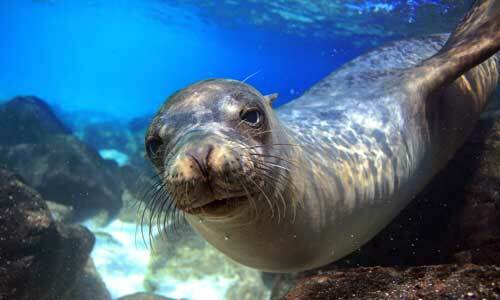 Galapagos is known as one of the most amazing diving areas in the world. Experienced divers come here from all over the world for cruises on the liveaboard dive boats or to do day dives out from the islands. Some yachts offer occasional diving but they do not operate this themselves; they get one of the land based diving centres to come out and pick you up from the boat. While you are doing this you are missing the activities that your fellow passengers are doing. So if you want to do a few dives rather than a complete dive based cruise, it is best to do this from a land base before joining your cruise. 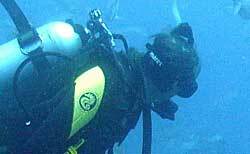 For more information see our diving section.